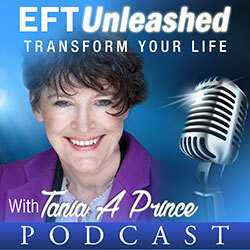 EFT(Emotional Freedom Technique) is a powerful tool for dealing with pain. Not all pain is bad, although it might seem that way. Pain is necessary, it lets you know there is something wrong. For example if you fall over and you have a pain in your ankle, you are likely to stay off it. This would be very important if you had just broken a bone. That is why it is important to check out pain. Chronic pain however, often no longer serves this function. It can become a barrier to living a fulfilling life. L attended an EFT Training Course in Manchester as part of that training, attendees are taught how to work with pain and physical problems using EFT. One of the approaches used is called, EFT Chase the Pain, another is how to work with the emotional drivers of pain. L kindly agreed to share her story and also to identify some of the things she needed to target with the EFT in order to get a result. “Never in a million years did I expect this (RESULT), I thought I would have this (PAIN) for life”. L’s pain started in 1992 after her head impacted with a wall. The result of this was that she was unable to move her neck and spent three days in a neck brace. After this she found that whenever she moved her neck suddenly it would lock! She couldn’t release it. This went on for four years. Around 1995/6 a chiropractor manipulated her neck, the result of this was a return of about 30/40% mobility. It also stopped locking. During this time she was told that she had chipped the C1 vertebrae. She had four years of treatment for the pain and stiffness. Train journeys were a problem for her, after a long journey she would suffer. Her job involved working on a computer and she found it difficult to rotate her head and angle it. She was in a state of continual stiffness which was worse in the mornings. She found it exhausting. 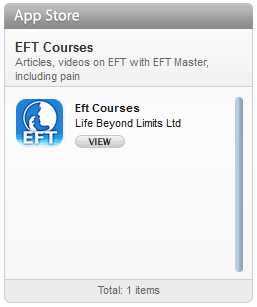 L attended an EFT Training in Manchester. 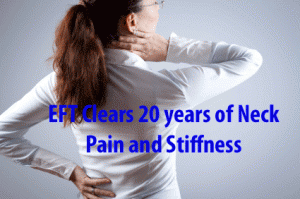 During this training she worked on the neck problem using the EFT Chase the Pain approach. This led to a massive improvement in the neck flexibility. However she worked further on the problem by dealing with potential emotions that were connected to it. One of the emotions she worked on was fear. She also used EFT on the physical problems in her hips. The body is all about balance. A problem in one part of the body can affect another part of the body. Clearing out the issue with her hips further helped the neck problem. After the EFT Training (about four weeks later) I rang L to get the feedback from the session. “I feel absolutely fine, no stiffness or pain”. She went on to say, “and no crackling or crunching”. On testing out the flexibility she was able to touch her chest with her chin and look straight up without any discomfort. She had been on a long train journey the day before and only realized during the call that normally she would feel very uncomfortable the day after, this time she didn’t! “Never in a million years did I expect this, I thought I would have this for life”. Expanding on this she said, “I thought I had a physical injury and it would never go away”. “I feel happier and more together than I have felt my entire life”. She also didn’t just target the obvious area of where the pain was, she addressed the whole skeletal structure. Also, structural damage was present, in her case, a chipped bone. She was able to release the pain regardless of this. It is important to realise that the body is not static. It is continually repairing, regenerating, rebuilding itself. For example the skin takes a few days to renew. The skin you have today is not the skin you had a week ago. The same is true of the human skeleton, only the timescales differ. Obviously if the body is renewing and repairing itself, it has to be doing so with a plan in mind. It is not randomly producing skin cells, it is renewing in line with what was there before. That is why if you had a scar before, even though the body renews the skin, it replicates the scar. This opens up a whole realm of possibility, is the body renewing itself complete with the chipped bone? Has it gone! Or has the chipped bone remained but the pain and restricted movement just gone. Interesting! 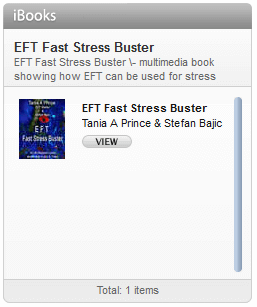 If you want to read about the EFT Chase the Pain approach follow this link. Questions to ask to find emotional roots to physical problems are, “if there was an emotional reason for this problem, what might that be?” Tap out whatever comes to mind.